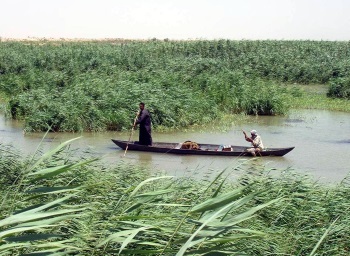 The Ahwar of Southern Iraq: refuge of biodiversity and the relict landscape of the Mesopotamian Cities covers the marshy delta that was home to the early Sumerian civilization. This mixed site consists of 7 locations: three archaeological sites (Ur, Uruk and Tell Eridu) and four wetland marsh areas. The latter are the Huwaizah Marshes, Central Marshes, East Hammar and West Hammar Marshes - important for bird migration and fish species. The area lies in the joint delta of the Tigris and Euphrates River, the river providing arable fields via the use of irrigation. Due to draining of large portions of the marshes, the marshes were diminshed to 10% of their original size by 2003. I visited this region of Iraq in the Fall of 2008. An opportunity arose for myself and some companions to visit the site of the ancient Sumerian city of Ur. I had seen pictures and read about the Ziggurat of Ur since I was a boy so I jumped at the chance. The greatest surprise was how extensive the ruins of the rest of the city are. We parked in the lot at the base of the Ziggurat and climbed up the steps to the top. From there the ruins reached out covering a vast area of the desert. Upon climbing down, we walked towards the rest of the ruins to explore but were stopped at the voice of a man calling to us from a distance. He approached and told us that the rest of the ruins were off-limits. We let him know that we meant no harm and were fascinated by the history of this ancient place. It was then that he introduced himself as Dhaif and explained that he was the caretaker of Ur. He said that his grandfather had been foreman of the workers during the archaeological excavations in 1922 and stayed on the site to take care of it after the British left. His father took over in the 1960's and he took over care of the place in the 1990's. He then offered to give us a tour of the entire place so, of course, we accepted. Over the next hour and a half he showed us the world's oldest known standing arch, the ruins of the palace of King Nebuchadnezzar, the Royal Tombs of Ur, and the House of Abraham. Possessing three generations worth of knowledge on the area, Dhaif was the perfect tour guide. With the wars in the area winding down, I would highly recommend a trip to this location for anyone interested in walking through several thousand years of ancient history. Ur was once an important Sumerian city state near the mouth of the Euphrates river, at the coast with marshy surroundings and regular floods and adverse weather impacts like erosions.Ur was already occupied as early as 6500 BC during the Urbaid period, but had its peak during the Sumerian period about 3000 BC. Buildings were made out of mudbricks and mud plaster. 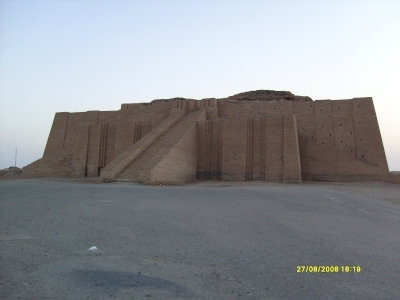 The main temple, Ziggurat of Ur, was built during king Ur-Nammu reign about 2040 BC. His codes of law (Hammurabi) is the oldest existing deciphered law writing in the world, the original at the Louvre museum, but replicas in many places including the National Museum of Iraq in Baghdad. On the basalt stele are 282 laws including the famous “an eye for an eye, a tooth for a tooth” rules. Ur is also mentioned four times in the Old Testament and in the Book of Genesis as the birthplace of Abraham 2000 BC.The site was first excavated 1853 by the British Museum and the British Vice Consul in Basra who also uncovered the Ziggurat (main temple dedicated to the Moon god Nanna)It was later on reconstructed, including its monumental staircase. However, the third level has collapsed, and its present height is 17 meters from the original of 26. Ur is surrounded by 2 ramparts constructed during Sumerian and Babylonian times. The closest city with infrastructure is Nasariyah, it has decent hotels and restaurants and at present no security problems. 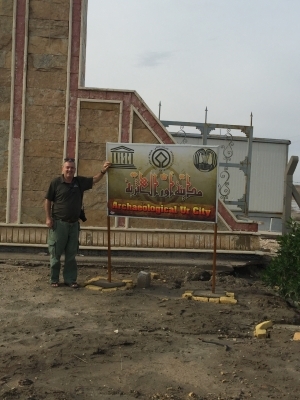 We have also visited Uruk where we could talk to German archaeologists at work to stabilize the temples, under the management of the DAI, the German Archaelogical Institute and Margarete van Ess who played a vital role in the conservation of archaeological sites of Babylon, especially Uruk und Ur. Oldest Buildings: 5000-3000 BC "The archaeological cities of Uruk and Ur and the Tell Eridu archaeological site form part of the remains of the Sumerian cities and settlements that developed in southern Mesopotamia between the 4th and the 3rd millennium BCE in the marshy delta of the Tigris and Euphrates rivers." Writing systems: the centralized control of resources and surplus which gave rise to the first writing system and administrative archives (nom file). The earliest texts known were found in Uruk. Ibn Battuta: Possible: "But I set out for al-Basrah... Our way lay alongside the Euphrates [probably an error, since Ibn Battuta stops at Wasit en route to Basra, and Wasit is on the Tigris River] by the place known as al-Idhar, which is a water-logged jungle of reeds, inhabited by nomad Arabs called al-Ma'adi." In the Pergamon museum: Inanna temple of Karaindash from Uruk. Former Largest Cities: Uruk: "At its height c. 2900 BC, Uruk probably had 50,000–80,000 residents living in 6 km2 (2.32 sq mi) of walled area; making it the largest city in the world at the time." (wiki). Eridu was the largest City around 3700 with 6000-10000.